I observed a Wood thrush nest for several days in Jenkins Arboretum, Devon, Pennsylvania, but on this morning in June there was only one of the two babies left in the nest. I had the privilege of observing this one fledge. Shortly after its first flight the mother returned with a large moth. 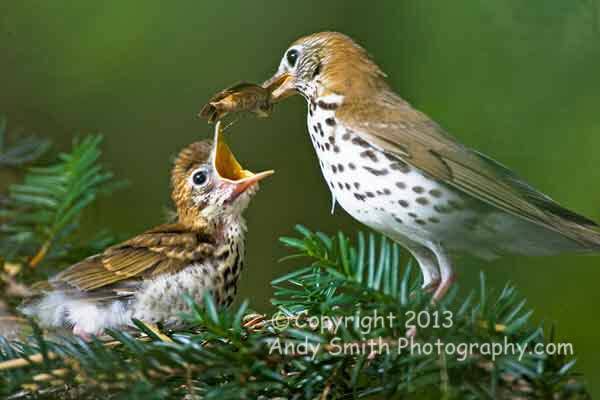 The Wood Thrush, Hylocichla mustelina, is one of the most common woodland species across the eastern United States. Its varied fluting song is more often heard than the bird is seen. Increased development of wooded areas is threatening the species. This image is one of the top 250 in the 2008 North American Nature Photographers Association Showcase.